Key refers to some core principles of the party that won't change - tax cuts, smaller government, a tougher stance on law and order, mutual obligation on welfare, and a fundamentally greater trust of the private sector to play a role. I only want to focus on one aspect - mutual obligation on welfare. The problem with mutual obligation is it cements in welfare. It legitimises benefit use far beyond what Michael Joseph Savage ever intended. Welfare dependence was supposed to be a temporary condition - not a way of life. By mutual obligation National means, for instance, making single parents on the DPB get their children to school with breakfast on board. Do that and it is quite OK to have children and expect the taxpayer to support them. This of course does nothing to reverse the effect that the DPB has had on self-sufficient, two parent families. Work-for-the-dole is another mutual obligation policy with pitfalls, being expensive to run and competing with the private sector. Mutual obligation means looking for a job or training for one. How come one individual has to pay for their tertiary education while another gets it courtesy of the taxpayer? No. Mutual obligation is just an attempt to damage control the current failed system. It does nothing to address the core problem of intergenerational dependency and the inherent injustice of one significant sector of society making lifestyle choices at the expense of another. 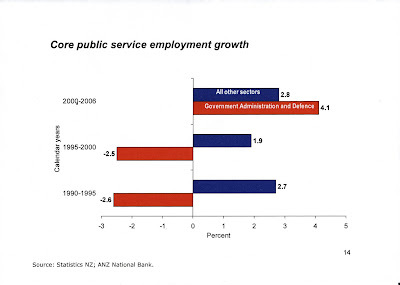 It is also firmly at odds with National's "smaller government" principle. I think I'm safe. I may be blonde but I have no tattoos. Rod Deane has a website, Independent Economics. 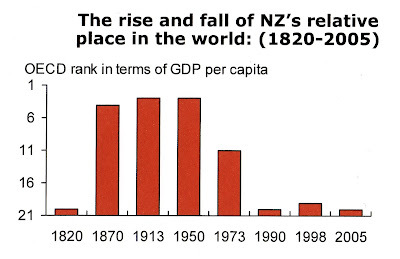 I have linked to the page featuring his presentation, The State of the Nation - An Economic Overview of New Zealand, which is full of interesting graphs like the ones below. I was just musing about the middle one. It may be the lefthand axis will have to be extended downwards in coming years or the bar will disappear! Oh and picture this. While Dear Leader delivered her glorious skite card to the Southampton University earlier in the week unbeknownst to her these graphs (and there are many more) are projected behind her - one after the other. What a comic but tragic juxtaposition. There's a romanticism about being poor but happy. Trouble is I'm not sure we got the second half of the deal. It was always apparent to me that the anti-smoking brigade would never stop at banning smoking in public places. This is the first attempt I have seen to pass legislation to prevent smoking in homes. It's in the Californian city of Calabasas. In the country that locks up more people for drug offences than any other, could we (well, perhaps not me) one day see tobacco added to the list of illegal substances? We’re fascinated to watch Labour’s fightback in the blogosphere, with the launch of a partyaligned blog, The Standard. Labour has trailed among bloggers, leaving commentary on the left to the likes of more left No Right Turn and the Greens' Frog Blog. Commentator Russell Brown’s Public Address is the granddaddy of New Zealand blogs, and sympathetic to Labour, but National has been reaping the gains of an enormous readership for David Farrar’s Kiwiblog - its daily readership rivals a modest daily newspaper. Just as important as their enormous readership, though, the blogs are influencing editorial content. Where they once drew their cues from mainly from talkback, reporters are now also daily watching the main blogs as straws in the wind. It helps give editorial weighting to the salience of issues. Labour scored a hit with a brutal (and unfairly edited) video of John Key at the Porirua weekend market. National have owned this space for a while. Blogs aren’t new any more, but their political sophistication, reach and influence is growing. I am sure you can find Labour's blog if you want to. I had a look and my only reaction is I am tired of blogs run by people who won't put their name to them. It is interesting also that Labour belatedly gets a blog going as their Electoral Finance Bill clamps down on free speech but exempts non-commercial blogs from the status of "election advertisements". Really. His comment here is very funny. He is responding to John Key, who justified the omission of Iraq from National's defence saying the war in Iraq is over. Helen Clark addresses the Southampton University with Social Democracy Under the Southern Cross. In effect it is a glorious and lengthy skite card. "And this is why polls are showing only a third of New Zealanders want my party and me to continue in government." Work and Pensions Secretary Peter Hain revealed that from October next year, the Government intends to require that single parents seek work when their youngest child reaches 12 - rather than the current 16. The age limit will fall to seven in October 2010, by which time it will affect 40 per cent of the 776,000 single parents in the UK. Very timid. I explained why here when criticising National's proposals. Without going into detailed demographic analysis, based purely on the total population, divide that number by 15 and you get 51,733. 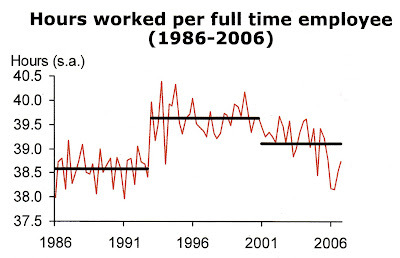 Using the same formula Australia (now work-testing their Parenting Payment when youngest is six) has around 86,000. The US has just under 1,000,000 adults receiving their DPB replacement (Temporary Assistance for Needy Families) which would equate to only 13,000 after adjusting for population size. New Zealand currently has 96,000 on the DPB. Most are single parents and many single parents are dependent on other benefits. I reiterate these are not highly specific calculations but I think you'll get the picture. I believe I can safely say we lead the world in single parent state dependency. I guess that coincides with being a leading feminist state. In the US Democrats have proposed hiking tax on cigarettes to pay for increased coverage of child health insurance. As the article points out this is a regressive tax because more low income people smoke than high income. As per NZ. Apart from the gems of irrationality contained (increasing cigarette tax will stop people smoking therefore reducing the revenue stream required??) what caught my eye was the amount of federal and state taxes collected from cigarette sales - $21 billion. Without going into elaborate calculations about demographics and the very latest revenue figures, it is immediately obvious that New Zealanders are paying a s..tload more tax on cigarettes than Americans. In 2004 NZ smokers paid $819 million (which by the way is estimated at around 3-4 times more than their associated health costs). Multiply that by a factor of 75 and you get $61.425 billion - nearly three times what the Americans pay. Instead of treating smokers with disdain we should be making a point of, each time we brush past one shivering outside, thanking them for subsidising government services. And it's a joke that we pride ourselves on caring about the poor in this country. We make them pay through the nose for what is often their only 'luxury'. The Christchurch Press features a pretty damning editorial about National and its recent performance ending with..... it should act like a party which says what it means and means what it says. That, I feel, is asking the impossible. National doesn't know what it stands for. It is now so philosophically compromised it doesn't know "what it means". It is starting to resemble the Green Party with lots of members with their own agendas. I also suspect that despite their morale-boosting run with the polls they are not particularly cohesive. You only have to ask yourself the question; how could an MP who had been happy under Don Brash's leadership be equally happy under John Key's? According to new crime statistics, there was more violent crime and more sexual offending this year but on the posiitve side more criminals were put behind bars. It would be more understandable if crime was increasing because fewer criminals were being locked up. The two together would make sense. That more criminals are being removed from society and violent crime continues to climb (most people in prison are there for violent convictions) is actually cause for concern. It is not a "positive". That crime statistics are steady is good news. Recorded offences for the fiscal year increased by only 115 (0.03%) and recorded crime per 10,000 of population decreased by just over 1% during the year. Police resolved 2,194 more offences than in the previous twelve months taking the resolution rate from 44.2% to 44.7%. These are very pleasing results from a policing perspective said Assistant Commissioner Grant Nicholls. An increase in violent crime is also good news because it indicates a successful focus on domestic violence. An increase of 4.4% in violence in part reflects the continuing focus on domestic violence and the continuing community intolerance to acts of family violence. Reporting of such crimes is going up. It is pleasing that murders were down to 50 for the year from 59. Sexual offences, which make up only 0.8% of recorded crime and known to be significantly under-reported, increased by 4.6% which also reflects Police working with other agencies and an increase in the trend to report such crimes as a result of increasing public awareness and reduced tolerance by society. The increase of 8.4% in property damage offences reflects Police and local communities focusing on alcohol abuse and graffiti. "The very encouraging reductions in crime in the three Auckland Districts is a result of the tremendous work by staff in those Districts combined with the increase in the numbers of staff over the past two years." Phew. So much good news. It's hard to take it all in. Let's have an electorate seat based in the United Kingdom seen as over 100,000 Kiwis live there. We could call it Earl's Court. And then let's have 5 electorate seats based in Australia seen as around 500,000 New Zealanders live there. Oh, OK. One of them can be a Maori electorate seat as 1 in 5 Kiwis living in Australia is Maori. Pita Sharples already has a name for it. This is a great idea. More MPs. Seriously, Pita has probably read this from the new Te Puni Kokiri report, Maori in Australia - "...it may well be that Maori in Australia make up a surprisingly large proportion of those voting in New Zealand elections in Australia, and that Maori in Australia greatly prefer the General roll over the Maori roll." "Many say leaving NZ has made them feel free - of daily negative news stories about Maori, of whanau obligations and of limited expectations either they or others had of themselves that stopped them striving for success. In Australia, they are aggregated with Pakeha New Zealanders as 'Kiwis' which is a positive rather than a negative, by and large. Research shows that many Maori consider that their relations with Pakeha are better in Australia than in New Zealand." It doesn't sound to me like these people will be rushing to embrace the backwards looking, victimhood propagating Maori Party. This story is bad enough on its own - a barman questioning a woman who was drinking a low-alcohol beer - but the poll that accompanies it showing three quarters of people thought he was right is just sickening to the nth degree. I cannot believe how many people think they have the right to stick their noses into other people's business. Is it any wonder we have such a meddling, snooping nanny state. It's a mirror of its myopic minions. Katherine Rich is smarter than many in National BUT she went wet on welfare and got dropped for it and now she is going wet on education. Key said education spokeswoman Katherine Rich was not in favour of bulk funding and the party was considering her position. No formal decision had been made and the matter had yet to go before caucus. According to the Herald on Sunday sacked Auckland University professor Paul Buchanan thought he needed to visit WINZ. He said he had visited Work and Income New Zealand to apply for the dole, but gave up on it because the $178 a week was "not worth my while" and he thought the questioning too intrusive. So he didn't need to visit after all. If $178 isn't worth his while then he isn't on his arse. Which is what a safety net is about. I am very pleased he was sent to a course along with "some other men who looked like they had been on the drink for many years"
This is exactly the sort of process Work and Income should be using because it helps those who desperately need advise and job-seeking skills and it deters those who really don't need the dole. Well done WINZ.